Imagine Dragons, is a rock band based in Las Vegas, Nevada, and comprised of vocalist Dan Reynolds, guitarist Wayne Sermon, bassist Ben McKee, and drummer Daniel Platzman. Reynolds and Sermon are members of The Church of Jesus Christ of Latter-day Saints. Reynolds met Andrew Tolman at Brigham Young University in Provo, Utah, in 2008. Tolman recruited longtime friend Wayne Sermon. During that year, the band won the “Battle of the Bands” competition at Brigham Young University, and the “Utah Valley University’s Got Talent” competition. Tolman recruited his wife, Brittany, to sing back up and play keyboard, and Sermon recruited Ben McKee. Dave Lemke played bass and sang backing vocals until 2009. 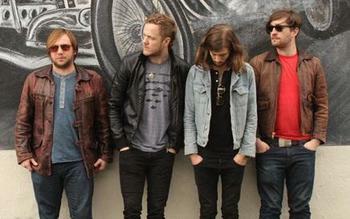 When both Tolmans left the band in 2011, Reynolds, Sermon, and McKee, recruited Platzman. Sermon, McKee, and Platzman knew each other at Berklee College of Music in Boston. Band members are elusive about the origin of their name, preferring to keep the meaning to themselves. Imagine Dragons is categorized as alternative rock, indie rock, or electronic rock, but Reynolds says that they try to write music that helps people cope with what is sometimes a hard life. Sermon says their goal is to reach people with music that is beautiful at the core in melody, lyrics, and structure. They want to uplift people. When the band relocated to Las Vegas (Reynolds’ hometown), they independently released three EPs, toured extensively, and gained a following. A big break came when Train’s front man fell sick prior to the Bite of Las Vegas Festival in 2009 and they were asked to fill in and performed to more than 26,000 people. Their debut studio album, Night Visions, peaked at number 2 on the weekly Billboard 200 chart in 2012 and is certified as Platinum in the United States, Canada, Austria, Portugal, and Sweden. The album is also certified gold in several countries, including Britain, Germany, New Zealand, and the Philippines. They have appeared on all the major late-night talk shows and have had hits such as “It’s Time” and “Radioactive.” Reynolds wrote “It’s Time” at his lowest, most discouraging point of his life. “I was dropping out of college, I was not happy with who I was, and I wanted to make some changes,” he said. And “Radioactive” has a spiritual theme. “It’s Time” was nominated for a 2012 MTV Video Music Award for “Best Rock Video” and “Radioactive” for the same award during the 2013 MTV Video Music Awards. “It’s Time” holds the record for the longest run on the 2012 Alternative Top 10 charts and was certified a double platinum single by the RIAA. “Radioactive” is the fifth best-selling rock song on the Nielsen SoundScan running list of best-selling rock songs in digital history. Billboard Magazine called Imagine Dragons “one of 2012’s brightest new stars,” and “the breakthrough band of 2013.” They were nominated for three awards at the 2013 American Music Awards: New Artist of the Year, Favorite Band, Duo or Group—Pop/Rock, and Favorite Artist—Alternative Rock. They won Best Rock Performance with “Radioactive” at the 2014 Grammy Awards. They were also nominated for Record of the Year. Imagine Dragons created a foundation in honor of Tyler Robinson, a devoted fan who battled cancer and found strength in the lyrics of “It’s Time.” Robinson suffered from rhabdomyosarcoma, a rare type of cancer that most often strikes children. Robinson, a member of the Church of Jesus Christ, chose to live a selfless life despite his intense disease. The Imagine Dragons’ music video “Demons” features footage of Robinson and Reynolds singing impromptu together at a concert in Provo, Utah. Robinson died unexpectedly on March 4, 2013. Funding for the foundation comes through concerts, fan donations, and company contributions. The Tyler Robinson Foundation assigns a financial adviser to families affected by childhood cancer and covers costs such as childcare, rent, utility bills, and travel costs for treatments. Imagine Dragons is big on personal charity. This page was last edited on 4 August 2016, at 13:43.